everyday dishes so many family meals were shared using them. When I left Los Angeles and moved to Maine to go to college, I was able to enjoy those meals much less frequently. But when my Grandmother was alive, I never once missed a Christmas Eve dinner at her house. My father was my Grandmother's only child, so my brother and I were her only grandchildren. We felt very, very loved. Pomegranates never stay in the fruit bowl for very long. These evergreen cuttings look like holly but are actually a Northwest native plant called Oregon grape. Lili used a few clippings for the photo shoot (it's visible in the magazine), and I thought it was such a wonderful idea that I've been using it all over the house lately. also crave them on my weekday morning oatmeal as well. messy pomegranates takes some orchestration. a lot of time and mess! And just who on earth could know such a secret? Yes, that's right, it's Martha Stewart. this process, although very time-saving, is not splatter proof. Here is one of my quarters after using a wooden spoon. splatters stayed in the sink basin due to hitting the pomegranate face down. For once, I had not one tiny splatter on my clothes! Trina, it looks so lovely and Christmassy and I love the story about your Grandmother and of course the really useful hint regarding the pomegranates! Wonderful! Congrats on your feature in Country Living...your home is beautiful...especially at Christmas! Thanks for posting more images of these beautiful dishes -- I had asked about them in your last post. Lately I have seen them in the Brocki (like a Salvation Army or thrift store here in Switzerland) and am beginning to buy random plates and saucers. I love them and the feeling of hominess they give me. I confess I've never bought a pomegranate - I may have to change that this week! Hugs & Happy Holidays from here! I'm going to try that! Great idea. Your kitchen is beautiful, simple and elegant. Merry Christmas to you and your sweet family. You may be very saddened to hear that I have never once tried a pomegranate. Hearing you rave about them (a women of obvious fine taste) is now making me think that is a great shame. I will seek one out and think of you as I happily splatter my sink in great expectation. Thank you for the lovely photos. Fabulous tip on seeding pomegranates. I watched the video (very helpful, thank you for sharing it). I'm going to put pomegranate on my grocery list and give this a try today! Also, beautiful transfer ware, and so sweet that it was your grandmother's. I love using things that belonged to my relatives. They have so much personal meaning and wonderful memories. Enjoy your Christmas with the babies! What a lovely memory you have - and your Christmas dishes look both cosy and fine at the same time! I always eagerly anticipate the arrival of the Christmas china. It's become a virtual tradition. 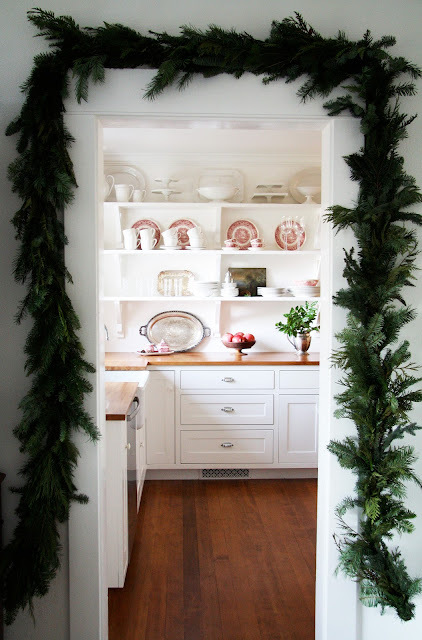 And I love the shot of the garland framing the view into the Christmas kitchen. 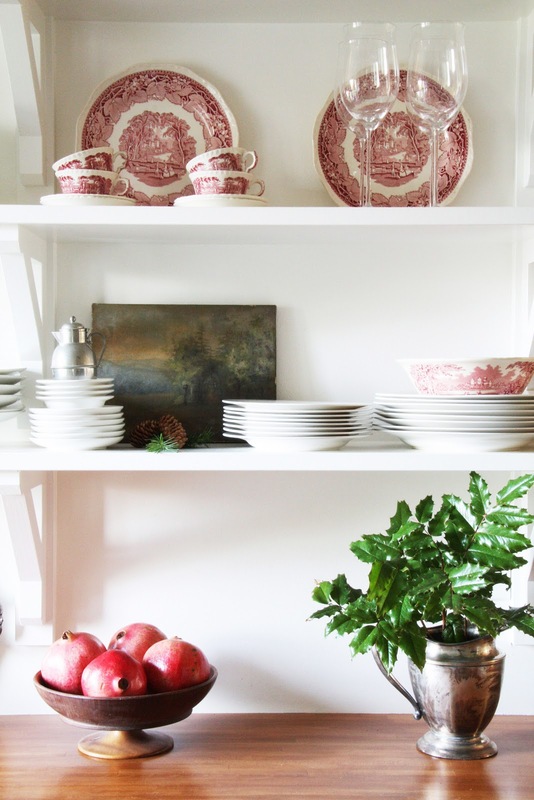 Pomegranates seem made for your kitchen. 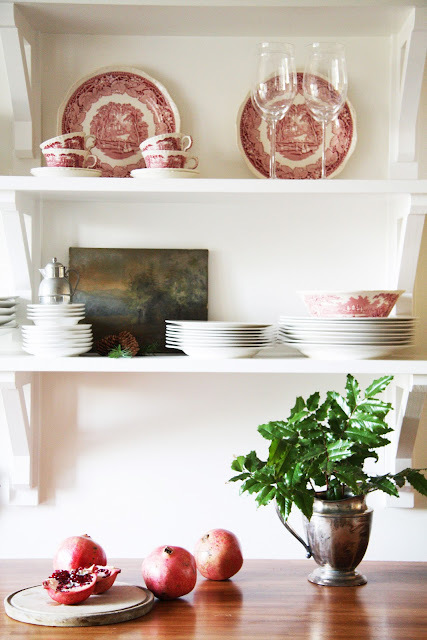 Those dishes look beautiful on your open shelving. I just bought my first 3 pieces of red and white transferware at an estate sale. You have to start somewhere, right? Your kitchen looks amazing. Thank you for sharing the sweet story of your Grandmother. You're so lucky to have your Grandmothers transferware as I'm sure it brings back wonderful memories every time you walk into the kitchen. How special to have your grandmothers dishes. They're beautiful and so is your kitchen! Merry Christmas!! I love your Grandmother's red transferware dishes at Christmas! How beautiful. You have inspired me to try pomegranates this year too. Yum! I love your kitchen! The transfer ware is gorgeous! 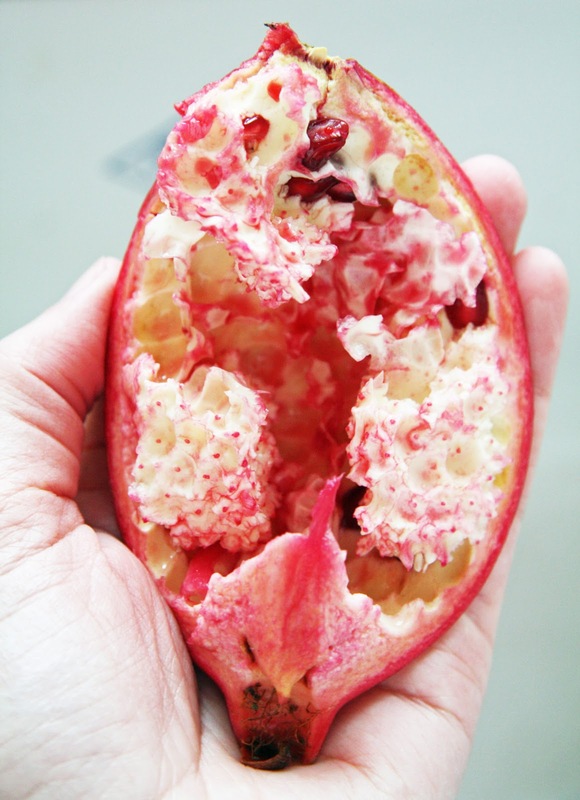 I've never eaten a pomegranate, but they look so tempting in yiur pictures! Trina I love the simplicity and elegance of the photos. I too have collected a few pieces of the red. Don't they remind you of toile? Love those transferware plates, they are perfect. We have pomegranates sitting in a hammered metal bowl with huge pine cones and greens and it brings such a Christmassy look to our kitchen. You are a wonderful delight to visit . . . Enjoy a merry, blessed Christmas with your family . . . I used to watch Nigella Lawson's show Nigella Bites and this is the way she did it too. Love the dishes. So beautiful and festive. Such a sweet blog. My eyes welled up when you expressed your love for your grandmother, by naming your daughter after her. I too loved my grandmother dearly. Your home is as pretty as your heart. Lovely! I use a large bowl filled with cold water placed in the sink. Cut the pomegranates in half and do all the scraping under water. Follow by straining into another container. No mess! The red transfer ware is so pretty set off by all the white. And the little painting tucked in there is a perfect touch. How brave you are to manage pomegranates and babies simultaneously! I know it would all make you your grandmother very happy. What a treasure you have in your grandmother's transferware. What memories you must have each and every time you use them.. Thanks for the hints about the pomegranates.. the grandson becomes obsessed with them this time of year.. I do like your transfer ware - our memories define us and it's lovely to have things passed on from generation to generation. Merry Christmas and happy holidays! love that you named your daughter after her....what a blessing to your father. I HAVE to pick up some pomegranates...you've given me a love for them! After hearing you talk about pomegranates, I decided to try them-I can't believe I waited so long! Thank you for sharing Martha's seed extraction process... your sink looks so pretty dressed up with those red seeds! Your grandmother's china was my mother's pattern and I have not seen it for years, how nice that you have it now. I love how you have arranged and displayed your china on the open shelves, it looks simple yet elegant. Perfectly simple, festive and so beautiful! So beautiful Trina! 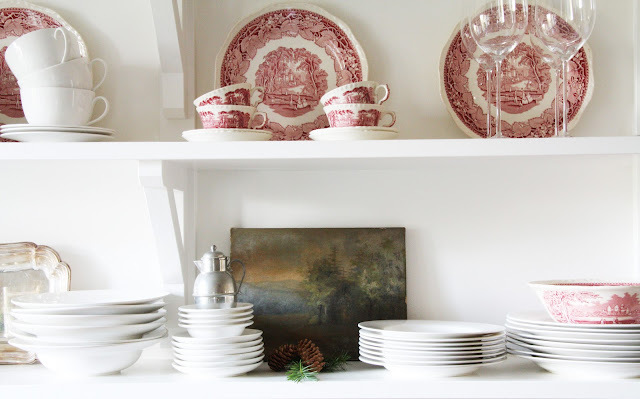 And of course I have the same affection for red transferware...especially this time of year. What wonderful memories you have of yours. PS. Your adorable babies are so precious! Can imagine the joy you and your husband must have with them! Your Christmas shelves are beautiful. So are your words. I love pomegranates, too. The seeds are a treat just by the spoonful! Love your transferware dishes...so pretty and perfect for Christmas. Gee, I haven't eaten a pomegranate in a while...I'll have to get some this week. Pomegranates always remind me of my Grandparents as they had a huge tree in their back yard in Virginia. I don't think that they even ate them back then, or at least I can't remember. We just used to throw them and smash 'em up! I hit publish earlier before I could add that I love you gave your daughter the gift of her grandmothers name. When I was waiting for the referral for my daughter I had already knew she would be getting my beloved grandmothers name Pearl as her middle name. I got grief about from some as being too old fashioned especially since her first name is Sarah. Oh well, it fits her beautifully and it makes us so happy. Thanks for the pomegranate tip - can't wait to try it. I was already planning on purchasing a supply tomorrow at market! So lovely! I have red transferware that I have collected over the years, with an emphasis on American scenes (especially places our family's visited on vacations: Monticello, Colonial Williamsburg, the Old North Church, etc.) Each piece is a precious memory, because it reminds me of wonderful family times! Enjoy your beautiful set! Your Christmas kitchen looks lovely as ever! I love the natural greenery garland leading to the kitchen too...just beautiful! What a wonderful way to de-seed pomegranates too! I plunge mine in water and the membranes float to the top, but I shall have to try this method! I'm curious! I use a Canon Rebel xsi! It's been a great camera for us. Your kitchen looks beautiful with the Christmas dishes. 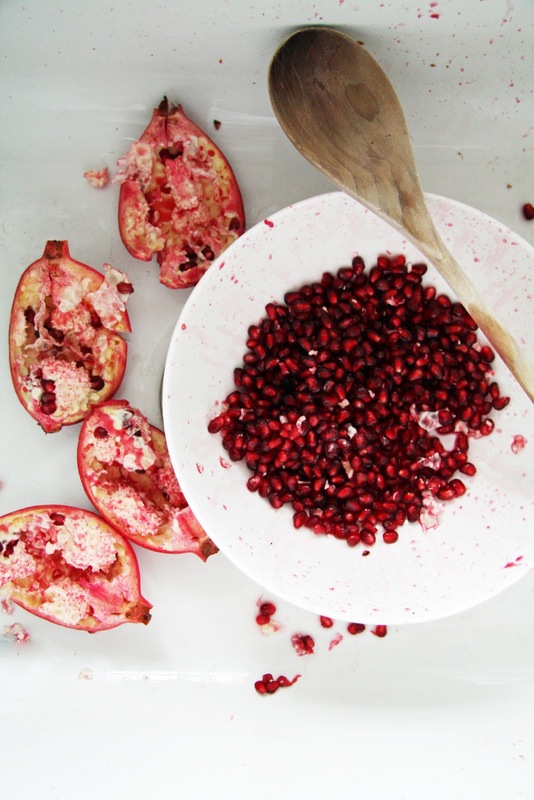 My husband & I love pomegranates so we will definitely be using this trick soon! We normally do the underwater thing, but this looks faster! Thanks for the tip! I just learned about your blog and it is such an inspiration. Your style and approach really speaks to me. Thankfully it seems that much of your work was completed before the arrival of your babies. Though I often dream of restoring an old farmhouse in our area, our 11 month old triplets make that seem very difficult. Thank you for sharing your vision. Thank you so much for the pomegranate link, as I, too, love pomegranates, but not the pink stains! Your kitchen is so beautiful, in every season. First things first, your 2 cuties in the last post...so precious!!! The kitchen looks wonderful and thanks so much for the tip on getting those elusive little seeds out! How does Martha make it look so splatter-less? the images of your kitchen makes for a beautiful still life, the story of your grandmother is heartwarming, the pomegranate tip......a big hug to you! How lucky you were to be so special to your grandmother. My mom was one of 12 and my dad was one of 6.. so.. we weren't all that.. shall I say.. special? 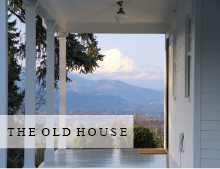 I live in Oregon too, in a turn-of-the-last-century house and I love your blog. A fun fact, I put the Oregon Grape on my blog and one of my English readers told me it's called "Mahonia". And the Governor's mansion in Oregon is named "Mahonia Hall". Now I know why! I read your web site faithfully, but never come to the blog site for some reason. I enjoy your photos, the comments, and of course, the babies. Never knew there was an easy way to de-seed pomegranates! I haven't had a pomegranate in years, Trina - think I'll try to find one this week at the market. Thank you for showing us your lovely Christmas Kitchen. Your images are beautiful, great mise en scene. I wish you, your family and all visitors to your blog a Merry Christmas. Take this opportunity to announce that January 02 Urbanascidades debut in 2012, the same ... but different. Your post is heartwarming ... a holiday gift for all of us. This is so gorgeous, and it was very touching to read about your grandmother. I wss very close to mine too and we always celebrated on Christmas Eve at her house. I've inherited her china, and I too treasure it. Merry Christmas! I'm intrigued by that oil painting and the juxtaposition of it and the red transferware. Lovely! By sharing that little instructional video, you have indeed redeemed poms in our home again! This is great! I love pomegranates too and will try your method. Margaret's dishes are lovely. Trina, Your Grandmother sounds so wonderful! What a stunning collection. Hope you all are enjoying the holidays. Visit our website for a chance to win some holiday sparkle from our home to yours! Hi Trina, we love to eat pomegranates too. I recently learned that you can de-seed a pomegranate in a bowl of water. No spatters and the seeds float to the top! That doesn't keep my twins from making a mess of them, though. The pom de-seeding method worked like a charm Trina. Thanks for posting it! Am having some in my porridge right now in fact :) hohoho! Dear Trina, I deeply appreciate your Christmas glimpses into your warm home and holiday. I deeply appreciate YOU. Thank you for your delightful blog which all the year long happily invites me into your Country Farmhouse. Oh, Trina, I ADORE your Grandmother's red transferware. My grandmother was Margaret also, and she had 28 grandchildren! For years I gave her a Christmas ornament for her tree. After she passed away, they all came back to me. Unwrapping those ornaments is one of my favorite moments of the holiday season. All the best to you and your wonderful family. I love your blog and your home!! I don't ever comment on your post although I am a reader... thank you so much for post about the pomegranates.. I LOVE them!! Love mixing old paintings into the kitchen - everything looks amazing. Craving a pomegranate margarita now! As always, the images of your home are so very beautiful. I am a "big bowl of water pomegranate peeler" also and find it to be mess free and quick. Think you might like to try it. Love your blog but was again reminded of my dilema. 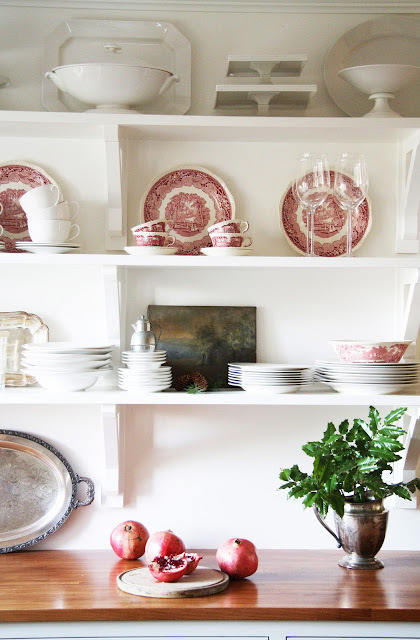 When I saw your first kitchen pictures I fell in love all over again with pretty ( I have loads of pink dishes )then I saw your 2011 pictures of the same kitchen, I am reminded of how much I love that look also. Right now my house is caught between both worlds. Thanks for the pomegranate tip. We ate every holiday meal on my grandmother's VISTA and I had the same wistful sadness when I began to miss family gatherings as a newlywed embarking on a new life with my Marine Officer. Though she had another granddaughter, I was named for her (favorite? ;) and her VISTA, along with her cookbooks and recipe box, was all I truly wanted of her estate. I drew out a few select pieces to carry as touch stones then tenderly packed the vast collection into deep storage with my parents, anticipating (correctly) that MOST military movers don't respect the term "fragile". This last year when my Marine FINALLY retired I designed my dream kitchen around my beloved grandmother's china. My LAST kitchen ;) is slated to feature in a future issue of a familiar shelter magazine ;) as our farmhouse is a "NEW OLD" LEED home that I carefully designed with my architect father. When you live in fourteen homes over twenty one years, you know precisely what you DO want and exactly what you DON'T "need" in a living space. I wish I was savvy enough to post a photo of my kitchen in your comment section. (I don't even really have a way to sign in properly to comment). Seeing our grandmothers' pattern used in your blog, in a kitchen that is so similar to my own, makes me giddy...AND weepy. Thank you for the artful sentiment. STUFF generally doesn't mean much to me, owing to the nomadic and serious nature of my husband's work, but these simple plates...they represent something REAL to me. And apparently to you as well. I think Margaret AND Laura would be very pleased with us. Pleased indeed.